Not many senior design projects give University of Utah mechanical engineering students a shot at a real gold medal. 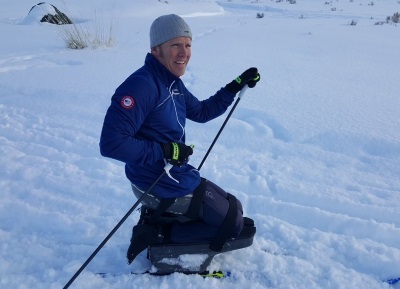 But that was one of the inspirational aspects of building a sitski for U.S. Nordic athlete Sean Halsted, a Rathdrum, Idaho, resident who competed in four events at the 2018 Winter Paralympics in Pyeongchang, South Korea. “Inspirational? Oh my gosh, oh my gosh,” said Mike Stark, 34, leader of the six-person U. team that undertook assistant professor Michael Czabaj’s challenge to provide Halsted with modern equipment to replace the antiquated aluminum sit-ski he’d been using. An Air Force veteran, Halsted was paralyzed when he fell 40 feet from a helicopter in a 1998 training exercise. “I would have done anything to help. How better could I put my education to use? All of the guys had that spirit,” said Stark, a native of Oelwein, Iowa. “We compressed two semesters of work into one, going through the summer because we really cared and wanted to do well.” More….